When a new law threatens to stifle online speech, to limit our use of the Internet, or allow others to control our digital devices, we can push back in a variety of ways—participating in formal consultations, calling or petitioning our representatives, exposing the proposal through the media, and bringing a legal challenge if the law passes, and so on. When individual companies threaten our rights, we also have options, ranging from boycotting that company, to "shaming" it into changing its practices, or if nothing else works, bringing a lawsuit or invoking regulatory action. But what do we do when the same threats aren't the result of a law or the practices of an individual company, but the result of a private industry agreement? For example, agreements between copyright holders and Internet companies that give copyright holders the ability to effectively delete users' content from the Internet, and agreements on other topics such as hateful speech and terrorism that can be used to stifle lawful speech. Unlike laws, such agreements (sometimes also called codes, standard, principles, or guidelines) aren't developed with public input or accountability. As a result, users who are affected by them are often completely unaware that they even exist. Even those who are aware of these agreements have few options for changing them, because users aren't a party to these private deals. They tend to cover multiple companies, so shaming or boycotting a single company isn't an option. And asking regulators to step in might not be possible either, because these agreements often have the active support of government officials who see them as a cheap and easy alternative to regulation. The Copyright Alert System or "six strikes" program between U.S. Internet providers and the content industry, which provides for monitoring of your Internet usage and the delivery of warning notices about copyright infringement. The European Commission's hate speech code of conduct, under which major U.S. Internet companies agreed to an expedited process for the removal of supposed hate speech and terrorist activity online. The Motion Picture Association of America (MPAA) Trusted Notifier Program, which requires Internet domain name registries Radix and Donuts to disable the domains of websites that are accused of hosting infringing content. The RogueBlock guidelines for payment providers, and Trustworthy Ads Guidelines for advertising networks, which block websites accused of hosting infringing content from accessing payment processing and advertising services. It's time to bring these agreements, or Shadow Regulations, into the bright light of public scrutiny. Today we're unveiling a new, revamped version of our interactive Free Speech Weak Links infographic, that maps some key instances of Shadow Regulation that exist at various levels of the Internet ecosystem where content and user behavior can be effectively blocked and controlled. At the same time, we're launching a series of blog posts that will delve deeper into particular agreements. As new Shadow Regulation threats emerge (such as a recent European proposal requiring Web platforms to do deals with media companies), we'll also be offering you the opportunity to speak out against them. 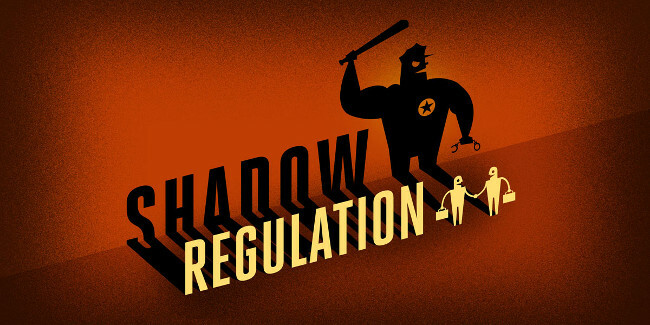 Shadow Regulation may be a new term, but it's a phenomenon that has been gathering speed for several years. To defend our Internet, we need to pay attention to the encroachment of these secretive, exclusive agreements, and challenge them when they pose a threat to our digital rights and democracy. Keep reading Deeplinks this week as we explore Shadow Regulation in more detail, and explain how industry-wide agreements, where they have to exist at all, could be done in a more inclusive, balanced, and accountable fashion.